Excavated at Albertirsa. Size: 54 cm/120 cm. 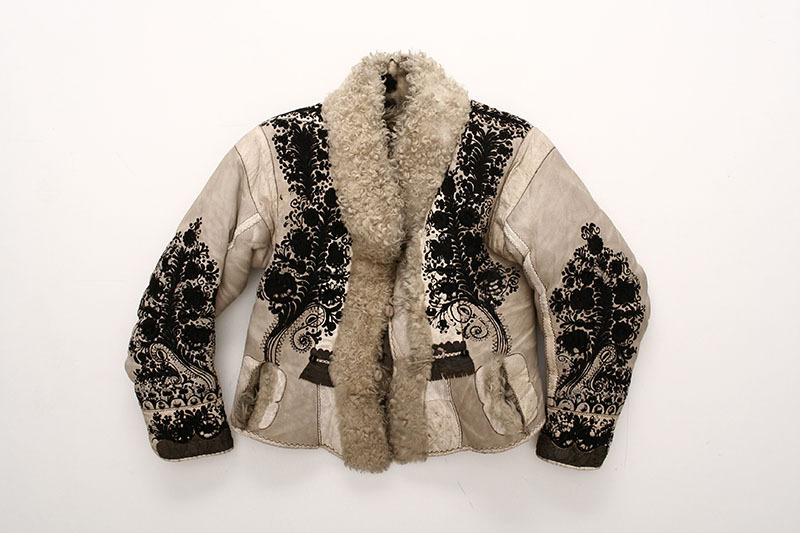 White lambskin jacket, with white lamb fur on its chest, back, sleeves and with rich black embroidery. Frilled bottom edge. Tailored of several pieces. Can be closed with three buttons at the front. The openings of two pockets can be seen at the front. At the back the decoration closes with frippery. The sewing lines are hidden by a white overlay. The jacket had an upstanding form, but was rather contaminated with grease and dust, especially at the end of the sleeves. The damages on it were mainly caused by usage. The pocket openings were torn, the pockets missing. The black embroidery thread had fallen out of the sample at several points. 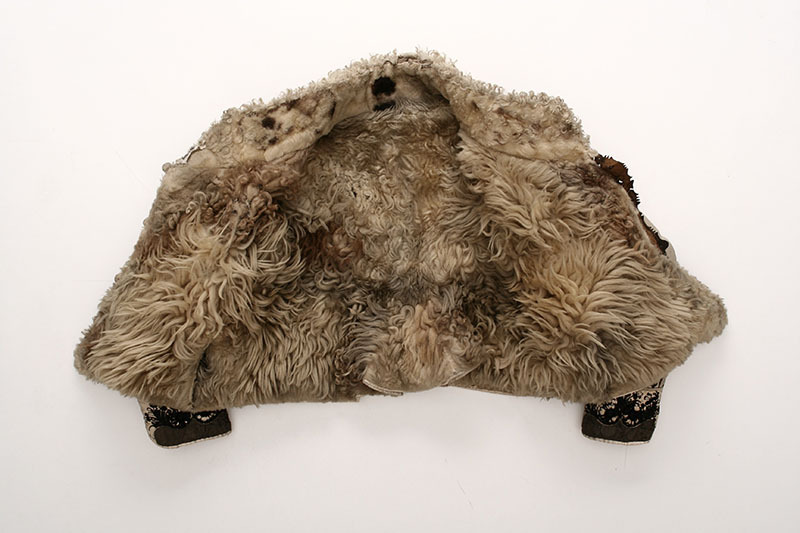 At the back the leather frippers were rather curled up, and the leather was cracked and weakened, especially the brown overlay leather on the sleeves and the floating decorated leather ribbon at the front. These leathers are all similar, so maybe the way of tanning was incorrect and that caused this strong decay. On the neck, the sewing has ruptured on one part. The inner parts seemed to be in good condition, but they were rather dusty. On some parts, I found insect’s chewing tracks, though no active infestation could be recognized. 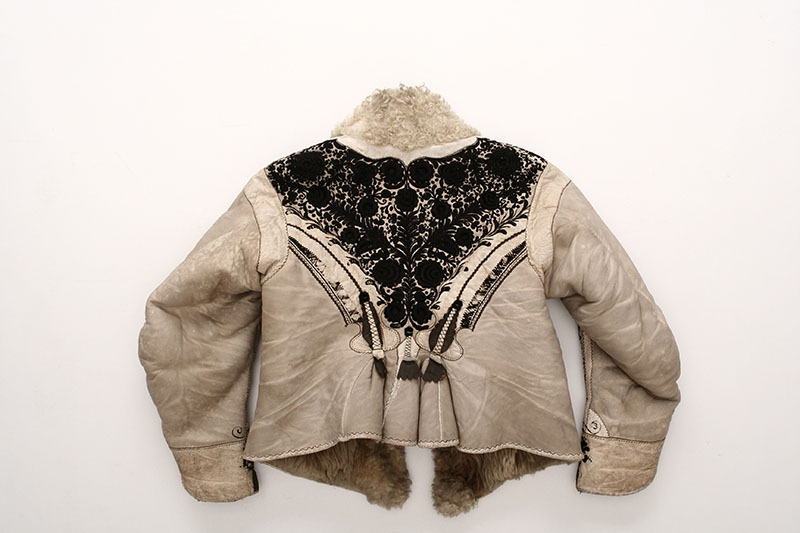 The aim of the restoration was conserving the jacket and strengthening the weakened parts. First, I cleaned the furless leather parts with Wishab latex eraser. I vacuumed the inside of the jacket, putting a thick net to the tube of the vacuum cleaner to avoid sipping up any small parts. The furry part had to be cleaned fractionally, avoiding strong humification as otherwise it would have reached through to the other side. So, I put cotton wool under each line of fur, then washed it with the foam of a mixture of distilled water (200ml), isopropyl-alcohol (300 ml) and some drops of surfactants (Prenol 10), moving from the inside to the edge. With that method, the inside of the jacket became very clean. For the finish, I wiped it over with a mixture of distilled water and alcohol. I didn’t replace the missing embroideries. I sewed the torn pocket openings, the gap at the neck and the bottom with thread painted with CIBA-IRGADERM. The front overlay was in a very weakened condition. I had to take it off the jacket and restore it separately. I fixated it with a thin, coloured stripe of leather that I glued to the original leather with rice starch. After drying, I cut it to form with a dissector, then sewed it back following the original sewing lines. After finishing the restoration, I prepared a wadded coat rack (from artificial wad and canvas) that protects the jacket from later deforming. This entry was posted in Ethnic Objects on 2013/09/12 by admin.